I am in Germany while I write this, taking part in a course for traditional German baking. While being here I visited some family members and found an old newspaper article. 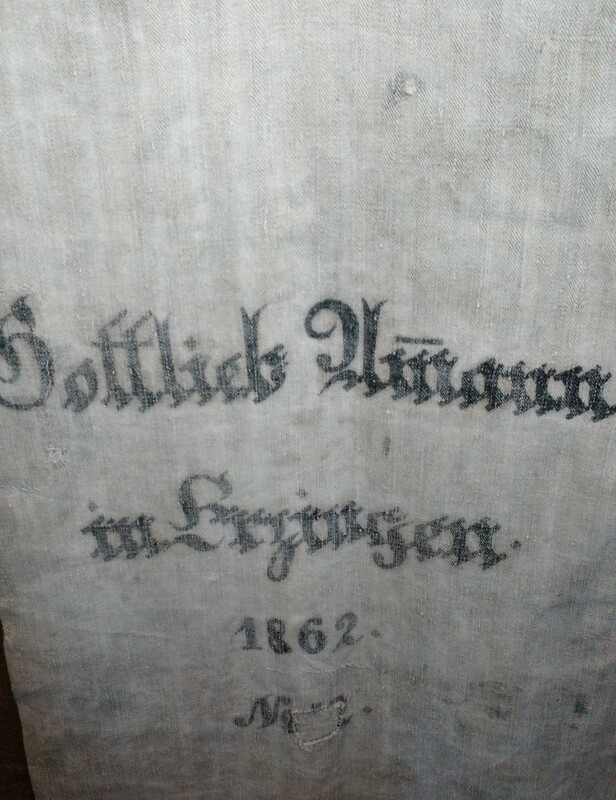 The top level picture you can see is a grain/flour sack from my ancestors mill in Erzingen (Germany) from 1862. The mill itself was established in 1746 but I was not allowed to take pictures of the old deeds in the township archives, not to destroy the old papers. 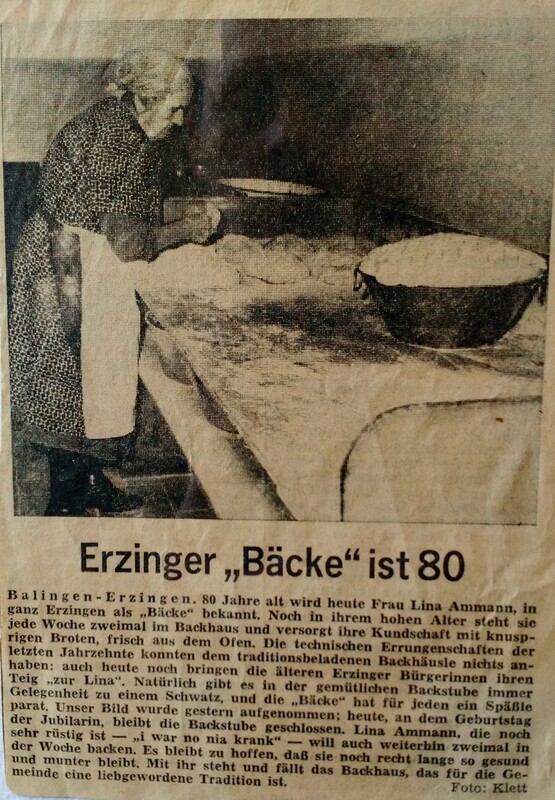 Today marks the 80th Birthday of Lina Ammann, known in the whole town as “Baecke” (Bakerlady). Even in her high age she is standing in the Bakehouse 2x a week and serves her clients with fresh crusty breads. The technical novelties of the last decades passed this Bakehouse without leaving an imprint. Even today (the article was from the early 70ies) bring the older ladies in the township their dough to Lina, in her Bakery is always space for a little talk and a funny anecdote. The picture you can see here, has been taken yesterday (at least 40 years ago). Today, at her birthday, the Jubilee decided to keep the doors of her bakery closed. Lina Ammann, which is in top shape for her age:”I war no nia krank” (I have never been sick) will keep on going with her 2x a week bakery opening times. We all hope she will stay healthy and mobile, as she became a tradition by herself. With her stands and falls the traditional bakehouse. My Oma Lina, lived and baked until 1981, when she was about 90 years old. About a month before she died she called the family and friends for her burial dinner (a tradition in southern Germany where friends and family meet after the burial of a loved one, for a light dinner in her honor. My Grand Gram was not your typical person, she decided she wants to be at her own last party. So when she felt the end is near we held her last party with her in our middle. Trust me, I was a young lad, but I do remember she had a blast, and more then one Schorle (wine spritzer) and Schnappsle (fruit brandy). The evening before she died she called my dad and me in and told us she is not going to bake the next day. We both knew she was going to leave us then, since she never missed a day of work in her life, through 2 World Wars she kept the bakery open and going. While I read and translated this, many early memories came back to me, and many things seem so eery similar. We both like to talk, prefer smiling to being bitter, and lets be honest, if you visit me, I will most likely have a laugh with you.